Oh Stone. What are you doing? You can't honestly think this beer is up to par. Looks and smells decent. Tastes like aspirin. This is not a good IPA. As a beer overall, it's fine. But come on Stone. You can do so much better. 22 fl oz bottle poured into pint glass. No date evident. Aroma - Moderately strong with tropical fruits and lesser grassy and floral notes. Flavor - Moderate+ strength for style with moderate bitterness due to a generous malt load that provides faint honey sweetness. No off notes. Tropical fruit notes are dominant, with a some herbal and faint dankness. Mouthfeel - medium body and carbonation. Overall - distinct and bold yet balanced, and no off characteristics. Mosaic/Loral/Mandarina seems like a really solid and interesting combo for a tropical, "scorpion bowl-esque" IPA, and I'm also proud of Stone for resisting the urge to put a bunch of fruit in this one. 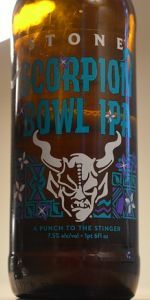 Can they pull off the intoxicating fruity flavor of a good scorpion bowl when armed with only their wits and their intense hop gusto? Let's find out! Pours pretty much the archetypal "Stone IPA" in my glass, but it's truly beautiful... crystal clear medium-golden body with a dense and striking head that leaves behind some spectacularly intense lace. Dense patterns of cobweb-like, consistent foam stick to the inner wall of my glass... awesome! Great legs too. I'm not surprised this looks great, but I'm consistently impressed by Stone's IPA beers' structural definition when poured and enjoyed. Lots of active carbonation going on here, too. Just wonderful. Tough to find this kind of thing these days! The nose here really takes me for a ride. Notes of pineapple, plum, passion fruit, blood orange and grapefruit combine with some slightly dank and resinous overtones that really succeed at giving off a reasonably-accurate olfactory facsimile of a scorpion bowl. I can even convince myself that this has a little bit of a rum note, thanks to the light dark fruitiness contributed by, you guessed it... Loral hops! This is truly a great use of such a weird, niche modern hop. I hated it in their Hop Revolver beer, and felt it would do much better in a saison or Belgian dark ale as a kind of "new-school" riff on those styles, but it melds well with the ubiquitous Mosaic hops here. The use of Mandarina definitely brings out some florals along with the orange-y elements I expect it to provide. Superb concept with great execution. How does it taste, though? Luckily, this avoids some of the pitfalls I can see coming with this idea. I commend Stone for keeping this in the moderately-strong ABV range (7.5%) instead of "imperializing" it and making it a sticky mess. There is definitely some malt deftness here, but when combined with the estery yeast character and the fruit-forward hop expression, it just feels super well-balanced. Flavors of pineapple, mango, papaya, passion fruit and orange combine with some light pine-esque bitterness toward the finish of each sip. I think the bitterness is a little bit too much, and this would probably benefit from a little bit less of a dry finish to give it a "juicier" feel... maybe some oats or something plus a little double dry-hop action? I can see this really being transcendent, but as it stands, it's a really good, successful beer in its own right. Poured a golden body, slight orange tint, with great head and lace. Bitter aroma that borders on being dirty and veggie (skunky). The taste is different from aroma as the beer is light, slightly dry and bitter with a crisp, dry finish (which at times is slightly offputting) but also has a semi-sweet tropical fruit burst that provides balance. I really enjoyed this offering from Stone. Lots of citrus and Pine. Not too bitter on the Finish. Almost reminds me of one of the New England ipas that are all the rage now. Very soft and smooth on the Finish. I had a couple of pints with some wings and really enjoyed the beer a lot. A: Pours a relatively clear medium golden honey orange in color with moderate amounts of active visible carbonation rising from the bottom of the glass and moderate medium golden yellow + burnt orange colored highlights. The beer has a two finger tall dense sudsy foamy white head that quickly reduces to a couple of small patch of thin film surrounded by a large patch of mottled very thin film covering the remainder of the surface of the beer and a thin ring at the edges of the glass. Moderate amounts of lacing are observed. S: Just shy of strong aromas of tropical/pineapple, tropical/papaya, tropical/passionfruit, citrus/orange, and herbal hops over the top of caramel + bready malts with a light amount of caramel sweetness. Hints of maraschino cherries. T: Upfront there are moderate flavors of caramel + bready malts with a light to moderate amount of caramel sweetness. That is followed by moderate to strong flavors of tropical/pineapple, tropical/papaya, tropical/passionfruit, citrus/orange, and herbal hops with light flavors of maraschino cherries. Light to moderate amounts of hoppy bitterness which does not linger for too long leaving lingering tropical cocktail flavors lingering. M: Medium bodied with moderate amounts of carbonation. Crisp with hints of dryness in the finish. O: I gotta say that the aroma on this beer definitely reminds me of those tropical cocktails they served at Chinese restaurants in New England in the late 80s/early 90s. Easy to drink with relatively well hidden alcohol. Enjoyable with a pleasant combination of tropical fruit flavors + aromas. L: Poured from a bottle to a pint glass. Had a golden-amber color and a clear consistency. There was a half inch of foamy, very long-lasting head. Excellent lacing. S: A nice aroma of hops, malt, citrus, pine, and tropical fruit. T: Tasted of a good shot of citrus (lemon, orange), a bit of malt (noticeable throughout), an above average amount of hops, some pine, and tropical fruit (guava, mango). In general, this is a well-rounded flavor. Lots of fruit is well-balanced with the hops and pine elements. A warmer, less punchy IPA flavor. F: A well-carbonated beer with a slightly slick finish. Medium-bodied. O: A very solidly made, easy to drink IPA. Not groundbreaking (what is, these days), but enjoyable. Bomber poured into a large wine glass. The Scorpion Bowl pours a deep gold in color and sports an inch of fairly resilient off white cap of foam. Fairly clear with some more copper hues when not in the light.